Careful With That Axe, Eugene: Bossed out of it for the last time! Why is it that some people think that people ahead of them in a queue won't mind if they skip the queue just because the have only one thing to purchase? I have previously written about a Queue jumper in a petrol station when I was second in a queue and was queue jumper was third. Yesterday I went to our local Centra to get some mince meat and burger buns (two items) for dinner. When I joined the queue to pay I was second behind Brian the butcher - he was buying the evening paper and some chocolates (two items). The attendant was having a small bit of difficulty with the till, but I didn't really mind. Suddenly, the woman behind (I'd guess in her mid 60's) who was buying pepper corns (one item) demanded that we stand by and let her pay because she had only one item to pay for. I objected and said I had only two, and that the guy ahead had only two items as well. This clever tactic (hoping to embarrass her) on my part didn't work - she told me that she thought I had more (I had an empty folded carry bag under my arm). She still demanded to be let through - everything in the shop had stopped at this stage. When I politely told her that "This is a queue" - she once again was not diverted from her quest to get ahead of us - she even started to tell us that she was in a hurry and had the dinner nearly cooked, all she needed were some peppers! Brian and I just stood back laughing and let her through - she wasn't in the least bit embarrassed by what she was doing, paid for her peppers, and left the shop without thanking us! Like the last time when I was buying petrol, in the end I stood by and avoided confrontation. I must have "eejit" written across my forehead - pushy "ladies" (I deleted several other names for women before settling on "ladies", least I offend my readers) have had their last one over on me - there won't be a third time! Next time this happens I will hold my ground and refuse to stand by - I won't care if the next pushy "lady" needs only to buy a plaster for a gushing wound. 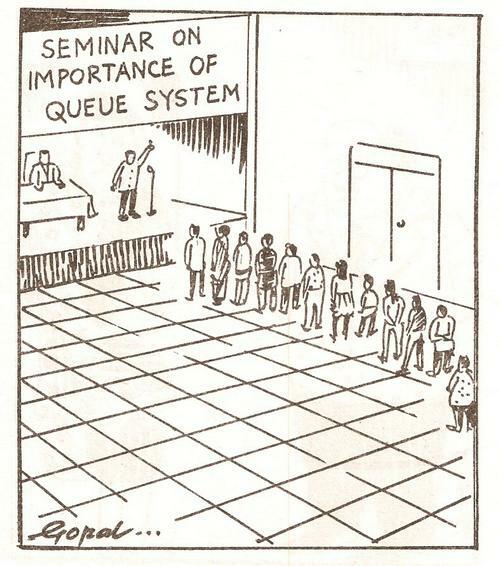 A queue is a queue, is a queue, is a queue! When I have to line up and wait my turn, well I don't see why I should have to stand by for someone else who thinks that the rules of queues don't apply to them.